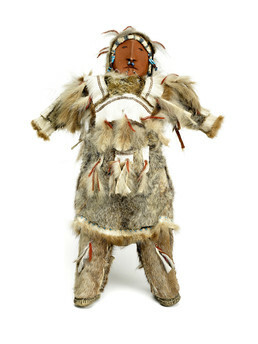 A Yup’ik girl’s dolls were toys as well as symbols of her future life as an adult. A girl played house with them, using miniature dishes and tools and blankets made of mouse skins. There was a strict rule against taking a doll outside during winter and breaking it was thought to bring endless cold and storms. Girls took their “pretend children” outdoors only after certain migrating birds – on Nelson Island, the red-throated loon – appeared in the spring. John Phillip, Sr.: Una wani inuguaq. Virginia Minock: Kusquqvagmiutauciqut? Piciqngnatuq. Atam atkua. John Phillip, Sr.: Waten-wa tanglallrulrianga nunamni ayuqellrianeng pililrianeng. Inuguarulia-w’ una wani piliaq taugaam piliaruluni. Inuguanek-wa tua atkuguarluteng-llu waten pililallrukiit inuguat. Neva Rivers: Pikangutacimegcitun pikangqerrutacimcetun pilitulqaitkut. Joan Hamilton: The dress and everything that is used imitated how the people in that village dressed. And then these decorations would be their family’s decoration, rather than any old way. Neva Rivers: Tiigneng. Makut maa-i tiiget akaurtellrani qaneryuarteqaallemni. Tiiget makut kumgai kumgalegneng pinaurait. Joan Hamilton: And around here [parka ruff] too. John Phillip, Sr.: Qanganaq-gguq tua-i atkuk. Waten-wa panika uum aaniin pilillrukii ayuqellriamek waten qaralirluku. Arnaruaruami, ai? Neva Rivers: And all the decorations. This is the imitation of lady, how they dress. Joan Hamilton: Because this is a female doll, that’s why they have these [decorations]. Neva Rivers: Wani-w’ un’ aturimauq qaillun aturatuullermegneng, itga. Virginia Minock: Tua-am Russian trade-atullrata. Una beads-angqerrluni. John Phillip, Sr.: Tuutangqertuq-gguq yaa-i. Virginia Minock: It’s just with beads [indicates chin], and the nose. Joan Hamilton: Oh, holes with beads. Aron Crowell: Neva, you were telling us yesterday about wearing three beads as nose beads. Neva Rivers: Mm-hmm. They pierced here [chin]. It would be one [center of chin] in here, or it would be two [either side of chin center]. And they put those [labrets]. They carve those little things, put ivory in here. John Phillip, Sr.: Nunivaarmiut taugaam avaqvaarkun maaggun pingqelallruut. John Phillip, Sr.: Taugaam ilait arnat waten uuggun pingqelallruut ukinerluteng. Neva Rivers: Ilait-llu pingqenrilnguut tattoo. John Phillip, Sr.: Ilait pingqerraqluteng tamlurutmeng. Aron Crowell: When did girls get their tattoos or labrets? Neva Rivers: Any time I want. I asked my sister to give me a tattoo in here [on hand between thumb and forefinger] and the other one by my other sister. It’s faded [right hand], and this one looks better [left hand]. Joan Hamilton: Waten niiteqallruunga paniit-ggut arnaurtaqaata nutaan tua piiyaurrluteng. Neva Rivers: Wangkut-ggun ulapequtekluku naskullraullemteni pillruunga. Joan Hamilton: I’ve heard in some villages, they tattooed on the hand when their daughter had her first menstrual period. But none of them know of that one. Neva Rivers: Nallunritaaqa taugaam agelneraaqamek-gguq taugaam kina imna aglekuni igaryulia makuneng arivlemineng nangtequtengqerkan nangtequ aglenraaqan-gguq pikani assiriciquq. Apciqaat tauna igaryartusqelluteng. Joan Hamilton: A young woman to do it, yes. Someone who’s just had menses to do that. Neva Rivers: Wiinga tau imkut tavaten nallunritaqa. Aron Crowell: This one doesn’t have tattoos does she? Joan Hamilton: No, she’s got the beads. Because she was saying that if they don’t want the beads, they’ll do the tattoos instead. Neva Rivers: Waten-ga tangruarutekluku un’ arnaulria una, arnaurtellranun qaillun arnam piciryaraa qanrutekluku. John Phillip, Sr.: Imkut aglenraaraat, una kiingan pivkenaku yaarciqsuutenqellruulriit-llu tua-i imarpigmek. Aglenraraat-w’ augkut qanrutkellri ellmikun pilriarunrilnguut cali maani wangkutni imarpigmun ayatulini aglinrarmek, agleqan wani tauna nutaan arnaureskan panini yuum angutem imarpigmun inerquumatullruuq atraasqevkenaku. Tua-i tamana tamaa-i angunqerraqluku wangkuta imarpigmiuni inerquutaq atungnaqellruluku avani. Tua-i-llu atraqan wani imarpik qailirluni nallungaita-gguq imarpim tuaten ayuqellra. Joan Hamilton: The sea will know, and the weather will become not suitable for hunting. There’s not too many of the absolutes, but this is one of the absolutes, not to even wade in the seawater. Virginia Minock: When we have our first menstruation, we’re not allowed to walk on tundra. John Phillip, Sr.: Five days-wa tuaten cuqengqelartuq anngaunani wani enemek tauten. Joan Hamilton: And there’s other rules, just one of them being if there’s food someplace, we don’t walk over it, and if we’re walking by, then we turn our skirt in and walk around it. John Phillip, Sr.: Naqugucirluku-llu. Kangiplugmek ilaluku neqem-llu, culugyuanek. Tanglallruunga wii tamakunek. Virginia Minock: During the first menstruation, they’re told to wear a belt on with charcoal on one side and on the other side a fin of a fish. John Phillip, Sr.: Nacarluteng. Umciggluteng. Naquggluteng. Virginia Minock: Cover as much as possible. Neva Rivers: Kiartevkenateng. Yuqerterraarluteng atam-ll’ qiptut. Joan Hamilton: We used to have designated spots where we had to go. John Phillip, Sr.: Aka-ggur avani wani tamakuurtaqaata can’gutnek tanglallruten can’gutnek. Tamakut iliitnun piluku pitullruut. Can’gutet imkut iluitnun tuavet elliluki tuancetetullruit. Neva Rivers: Evegtatullruukut bundle-auluki. Tamakut-gguq iluitnun qamavet elliluki. John Phillip, Sr.: Ii-i, tuaten tua-i five days uitavkarluki tuaten. Joan Hamilton: Like a little shelter. Neva Rivers: Qillertat waten. Qukaatnun qukviulluku kanani uitaarkauluni. John Phillip, Sr.: Ii-i, waten ayuqellria. Tua-i ikirrluki-gguq iluitnun ekiurraarluki itercetlariat. Ici-w’ can’gutet aneskuvki eniini iliit aneskuvki tuani iluani uitayugngaciquten. Tuaten wii niitellruaqa. Tanglallruunga tamakunek. John Phillip, Sr.: Ellami. Ellami ici-w’ uitatulriit can’get. Kiagmi taugaam. Tuaten qanlallruuq augna qanemcikesteka. John Phillip, Sr.: Uksumi-w’ enemi pitulallilriit. Tuaten taugaam nallunritanka enemeg’ anevkayuitnilarait uksumi. Enem iluani-gguq capqucirluki waten uitavkatullruit. John Phillip, Sr.: Yuum inuguarukuni avani pikuniu, alerquutengqellruut makut inuguat cali uksumi wani anutaaresqevkenaki-llu ellamun. Tuaten tua-i alerquuterluteng inerquuterluteng makut tamakut nasaurluut uksumi wani ellamun anuulluki ellami inuguaresqevkenaki. Joan Hamilton: There’s all of this qaneryarat [information] associated with the objects we’ve seen. Those are to teach, like discipline. Discipline was critical in surviving, so it’s not just an isolated thing. Each one of these has associated with it all the different teachings, like he gave an example of. Neva Rivers: The doll is not supposed not to be brought it out during wintertime. We very strictly put away our dolls, not to use in wintertime. We put them away, until the birds start to come in. That’s the only time we are able to take them out and play with them. That’s what they try to tell us about [with that story]. They forbid us to take them out because that thing had happened a long time ago. Because if you bring dolls out, the weather will change. Virginia Minock: Winter will be longer. Joan Hamilton: Violation of the rules. It’s part of the whole discipline, you know. You don’t just play with them any old time. You have certain periods you do certain things. Neva Rivers: Everything they taught to us, everything we follow is what their parents or grandmothers tell us that had been happened a long time ago, and we believe in that. We never played with our dolls, never play with them in wintertime, because we were scared. Aron Crowell: Are there other toys that can only be played with at a certain time of the year? Neva Rivers: That’s the only thing that I know of, about the dolls. John Phillip, Sr.: Makut wani tua-i tangvagaqamteng imumi inugualrianek wangkuunguarcelluki pitullruut. Qanemcissuutngulriacetun ayuqluteng, taungunguarcetaqluki ukuk nulirqelriik ayaguarcetaqlukek. John Phillip, Sr.: Inerquutnguciat-wa anrutkeka elpengqelliami tua-i tauna inuguaq tuaten ella pillrulria. Augkut tua-i nasaurluullraat ayagniutekluku yuungaqsaramun-llu matumun ici-w’ wangkuta tuaten pinguarturtelluki elitnaurutnguluungatlallruut makut qanemciit. Qanerturuartelluki-ll’ piaqluki elmegcecicetun. Neva Rivers: What we have learned, we do with the dolls. We let them sit down and let them pretend their sewing, pretend them she’s cooking. Irniangqerrlutek-llu [they would also have children]. Irniara-llu tunumigcitaqluku [she would let her doll have a pretend baby on its back]. That’s how we learned how to create a family. And the daddy would go out seal hunting, and she will share with the others. We make a clothes for them, practice. We learn a lot of things from the dolls. Joan Hamilton: You learn your patterns. Learn materials and their properties. Neva Rivers: This is only for summertime, not for wintertime. In wintertime, we take over with the yaaruiq [story knife]. We play with our yaaruiq. Virginia Minock: And that’s one thing too, when they become young ladies, they don’t let them yaaruiguq [tell stories with a knife]. Neva Rivers: Cugalit qemagtetullruaput cugakcuaraput. 1. Tiik or tiiggluk is “striped cloth, calico, mattress ticking” and comes from the Russian word tik (Jacobson 1984).